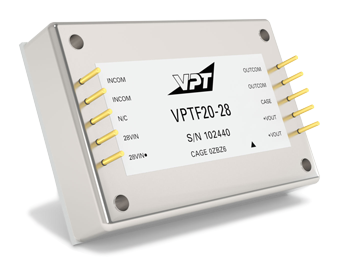 VPTF20-28 EMI Filter | VPT, Inc. The VPTF20-28 EMI filter filters conducted emissions of multiple VPT Series DC-DC converters up to its current rating, providing compliance to MIL-STD-461C/D/E/F for conducted emissions. A proven design heritage and a rugged all-metal package ensure long term reliability. Wide input voltage range: 0 to 50V with 80V transient for 1 sec.